AKIPRESS.COM - Mitigating the increases in floods, droughts, melting glaciers and other climate change-related effects requires coordinated action at the national, regional, and global levels, said Cyril Muller, World Bank Vice President for Europe and Central Asia, during his visit to Tajikistan on June 20. Muller highlighted the importance of joint regional and global actions in water resources management during his opening speech at the High-Level International Conference Water for Sustainable Development 2018-2028, organized by the Government of Tajikistan and the United Nations in Dushanbe. Water is an important driver of Central Asia’s economies. It is critical for the agricultural sector, which employs over 64 percent of the population in Tajikistan. But as glaciers retreat in many parts of the region, this important source of water may no longer be reliable in the decades to come. Muller also noted that modernization of institutions, infrastructure, water management, and technology can bring significant gains in water productivity in Central Asia. He highlighted the importance of cooperation on water and climate change issues to make the economies of Central Asia stronger and more climate-resilient. He commended the efforts of Tajikistan in promoting a regional dialogue and cooperation on water issues. During his visit to Tajikistan, Muller met with President Emomali Rahmon, Minister of Finance Faiziddin Qahhorzoda, and representatives of the development community. 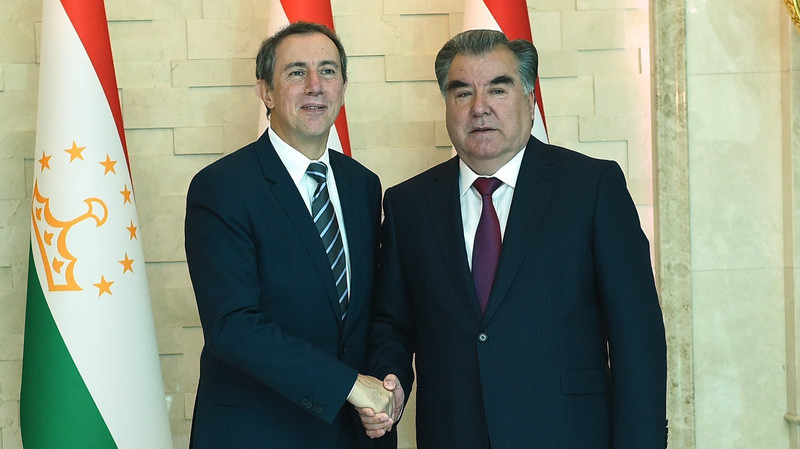 Muller reconfirmed the World Bank’s commitment to supporting Tajikistan under the new Country Partnership Framework for 2019-2023, which will focus on improving economic opportunities and services for people, including in rural areas, building human capital, and realizing the potential of the energy sector. It also aims at building the basis for the private sector to take full advantage of the opportunities emerging from the improved external environment. The World Bank delegation to the High-Level International Conference included Senior Director for Water Global Practice Guanzhe Chen, World Bank Regional Director for Central Asia Lilia Burunciuc, Practice Manager for Water David Michaud, and Country Manager for Tajikistan Jan-Peter Olters. This year, Tajikistan and the World Bank Group are marking 25 years of membership and collaboration. During this time, the World Bank provided over US$1.4 billion in IDA grants, highly concessional credits and trust funds to Tajikistan. The World Bank Group is committed to continuing its support to the country, as it strives to improve the lives and meet the aspirations of its young and growing population.